We typically think of the Jurassic period as the age of dinosaurs but they were certainly not alone – sharing their habitat with small rodentlike animals. Two new species have recently been uncovered in China — one of them was a tree-dweller with sharp, horn-like claws, while the other newly identified animal appeared to be equipped for digging tunnels with its shovel shaped paws. While rodents of this era were thought to be mouse-like scavengers, the new discoveries are important because they suggest that even this early in mammalian evolution, they were already a diverse group. 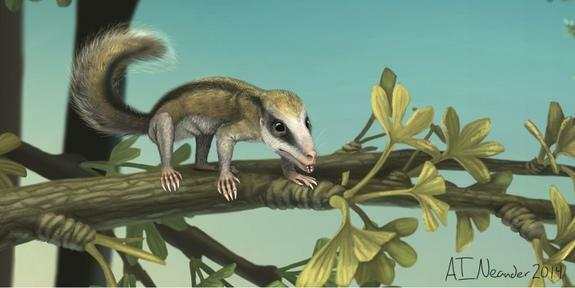 The newly classified Agilodocodon scansorius, has set a record as the earliest known tree-dwelling mammal. It bore several features essential for climbing trees: long claws, spade-shaped front teeth necessary for chewing bark, as well as flexible elbows and ankles for climbing. The Agilocodon was also light, weighing approximately 1.4 ounces. These rodents lived in what was a formerly temperate climate, part of what used to be the supercontinent Laurasia, made up from tracts of modern day Asia and Africa. The rocky land was once a forests, enveloped by lush plants and a large variety of insect life. Their specimen likely lived along an ancient lake’s hilly shore, where it was believed to have fallen off a tree top and drowned, allowing it to become trapped in the lake sediments and become fossilized. The lake is now a sand bed in inner Mongolia, known as the Daohugou Formation, and the rodent’s remains were dug up in 2011, over 165 million years after the animal died. It is currently one of the most fossil rich areas in the region, a place where fossils of feathered dinosaurs have been found, as well as rare fossilized pterosaurs and prehistoric amphibians. Although the area is known for successfully preserving such delicate animals, paleontologist Zhe-Xi Luo of the University of Chicago, was impressed by the prominence of the Agilodocodon fossil. The second animal, classified as Docofossor brachydactylus, was discovered by another fossil hunter at the Ganggou Fossil Site of China’s Hebei province, back in 2012, a prehistoric river basin dating back 160 million years. The Docofossor was somewhat smaller than the Agilodocodon — standing only 3.5 inches high and weighing only about 0.6 ounces at maturity, according to the researchers. It is an important discovery for another reason as well. So far, Docofossor is the most ancient underground-dwelling mammal that has been discovered to date, perhaps a precursor of the mole, with shortened limbs ideal for digging underground. The Docofossor even bears a passing resemblance to the African golden mole. The fossilized skeletons of both animals arrived at the Beijing Museum of Natural History while still enveloped in stone. Luo and fellow researchers both at the Beijing museum and also the University of Chicago were able to confirm the provenance of the fossils, and published two reports on Thursday in the journal Science that described the fossils in depth. Both animals belong to the same order, known as Docodonta, an extinct order that shares a common ancestor with modern mammals, particularly rodents. What makes this discovery so significant is that scientists used to only have fragments of bone and teeth to work with in describing the order. Aside from Castorocauda, a beaverlike mammal with a tail, also found at Daohugou and living in the same age as Docofossor, and a small mammal called Haldanodon which was found in Portugal in the 1970s, paleontologists had no skeletons of docodonts. “What’s new with this discovery of two additional docodonts is that one of them turns out to be a subterranean mammal with highly specialized digit patterns; the other is a bona fide excellent tree climber,” Luo said. “From their locomotory functions, we can safely infer that docodonts’ ecological diversity had a tremendous range — far more so than we previously anticipated.” While their existence may have been eclipsed by the dinosaurs, the discovery of the rodents reveals the underworkings of a very diverse ecological system in the Jurassic period.